Protect your sensitive electronic parts from ESD and similar dangers with Quantum Storage Systems’ Conductive Bins, Totes & Accessories AND save shipping costs on eligible items at QSource.com. These Quantum storage and transport containers are a durable, high-quality/low-cost solution to battle ESD dangers. With these conductive bins & totes, you’ll worry less about typical electromagnetic interference (EMI), electrostatic damage, or induced fields. Quantum’s conductive products are constructed of carbon-filled, copolymer polypropylene, have a surface resistivity of <105 Ohms, and are unaffected by washing with normal cleaners. Our Flickr photo set and two videos focus on the Dividable Grid Totes & Containers and the Stack & Hang and Shelf Bins. We’re sure after you get these closer looks, you’ll be convinced Quantum’s Conductive Bins & Totes are the answer to your ESD safety needs. 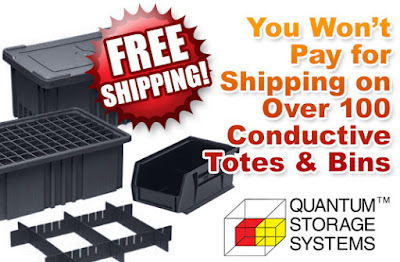 Please visit our "Free Shipping on Quantum Storage Systems Conductive Bins & Dividable Totes" page to shop and save shipping costs today. You may also contact us by phone (800-966-6020) or email.